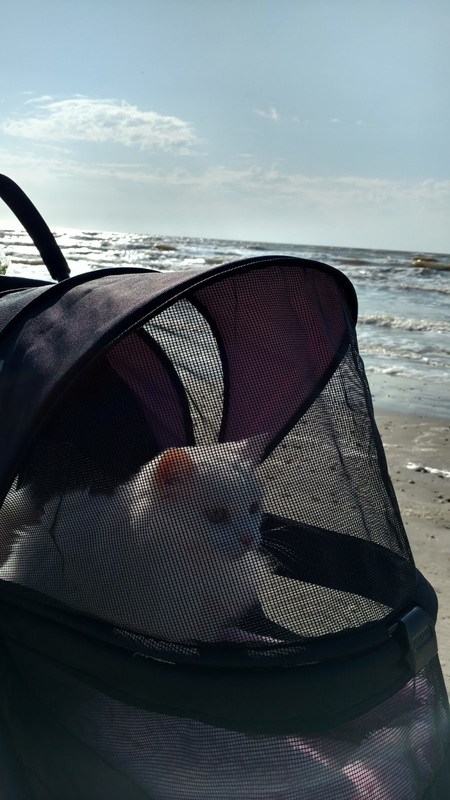 I really like this campground and Galveston. 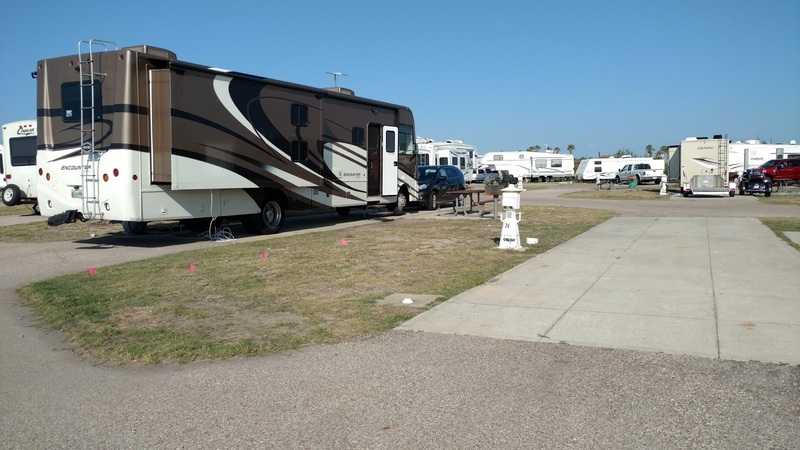 It is a tourist area, but relatively quiet and the campground is right on the beach. 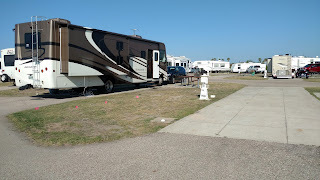 WiFi is good here and the campground, although not grassy, is pretty nice. The wind on the beach is pretty strong and it is a bit cool, but I guess that's the beach for you. The sand here is not white like the Gulf Shores/Panama City area, but darker with more shells. We aren't beach people anyway, so a little walk on the beach was all we were up to. 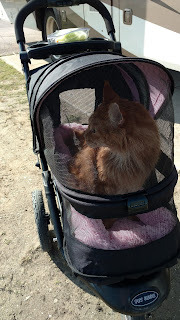 Bentley had a couple of strolls around the campground and down along the beach. He was busy looking at everything along the way. It was definitely windy here. We heard there were wild bunnies in the campground, so we brought along lettuce and baby carrots, just in case. 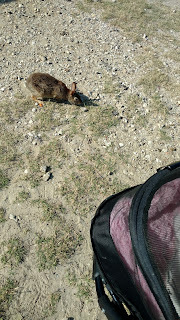 Just as we came back over the dunes, a bunny came out and stared at us as if he was asking for his treat. I'm sure he is used to being fed by the campers here. He wasn't too happy with the lettuce, but ran off with the carrots and came back for more. He looked well fed. When Bentley came back, Finnegan was at the door and seemed to want to go out. 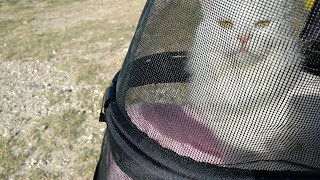 He was next for a stroll around the campground. 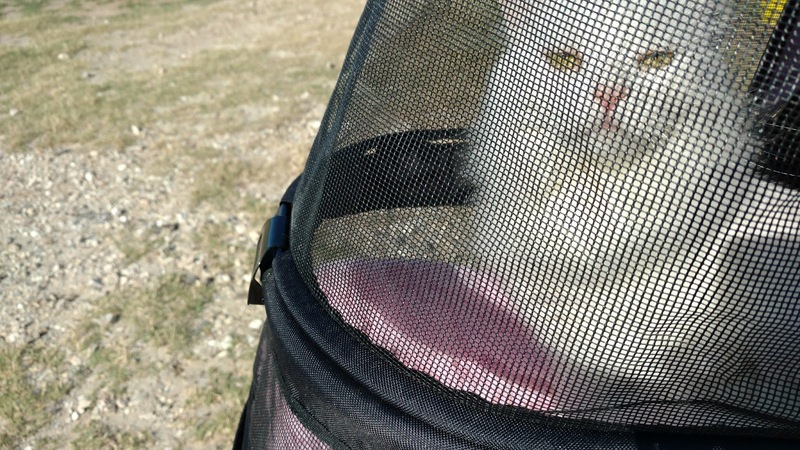 He didn't enjoy it as much as Bentley. I must say I slept rather well in this campground with the sounds of the ocean and the cool breezes blowing through. It was very relaxing, but humid. On Thursday, we had a nice quiet day in Galveston. 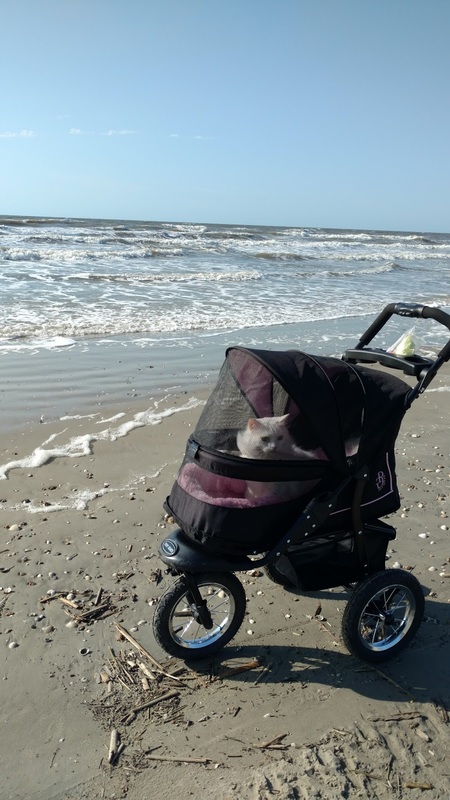 We had no real plans and just took another walk or 2 to the beach with Bentley and a trip to Petsmart to buy a new brush for the kitties. Along we way we noticed tons of people parked along the beach and roadway near the amusement pier and all along the other side of the road. Most of them had cameras with long lenses. 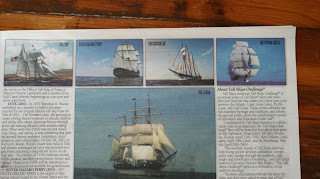 When we looked out to sea we could see a whole fleet of old tall sailing ships sailing along the coast. They were beautiful. Unfortunately we only were able to get a picture of one of the smaller ones. The largest was was the Elissa, built in 1877. It was a huge ship and very striking as it sailed along. This was a local paper telling all about the ships and activities while they were in Galveston. We are leaving on Friday, so we won't be able to go on board and take a tour since that will be happening over the weekend. They were certainly a sight to see. 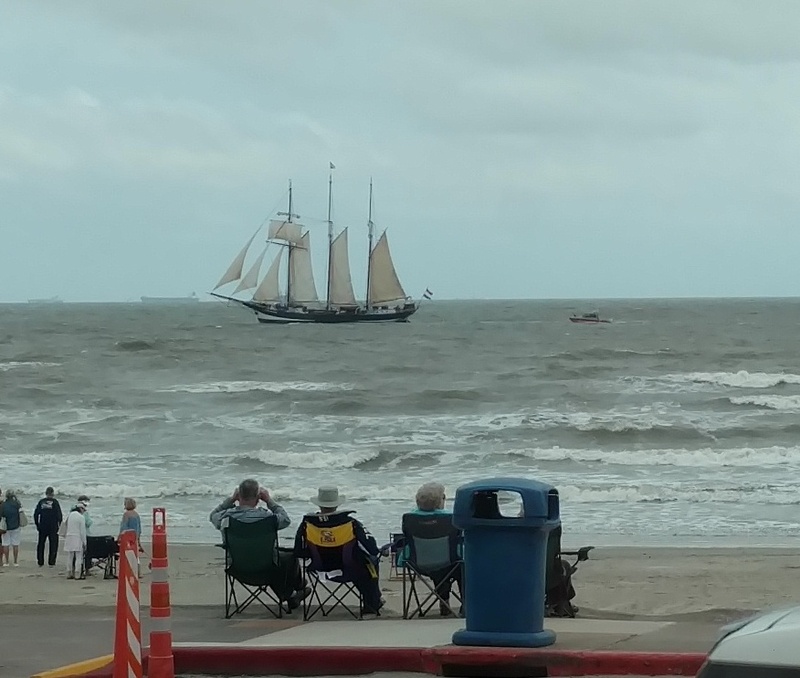 The waiter at the restaurant told us this was the first time the tall ships have come to Galveston. 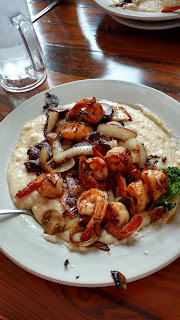 For a late lunch/early dinner we went to Miller's Seafood, an older restaurant with excellent shrimp and grits. I think I've had enough seafood for a while and I'm really for some Houston food. 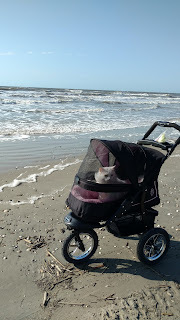 We have really enjoyed Galveston and wouldn't hesitate to come back again. I've forgotten to check your blog all week. I'll have to go back to the beginning and check out all your adventures. I know you've having a great time. I've never been in the Galveston area at all - or anywhere along the coast. We really enjoyed Galveston. The beach areas were not as nice as the Gulf coast. I love those ships and also thinking about the kitties riding along in the wind with all those smells!